Tracey Christie, the president of Bowood Properties, says work on the former Genosha Hotel will be complete by the 2017 deadline, despite a months-long work stoppage. 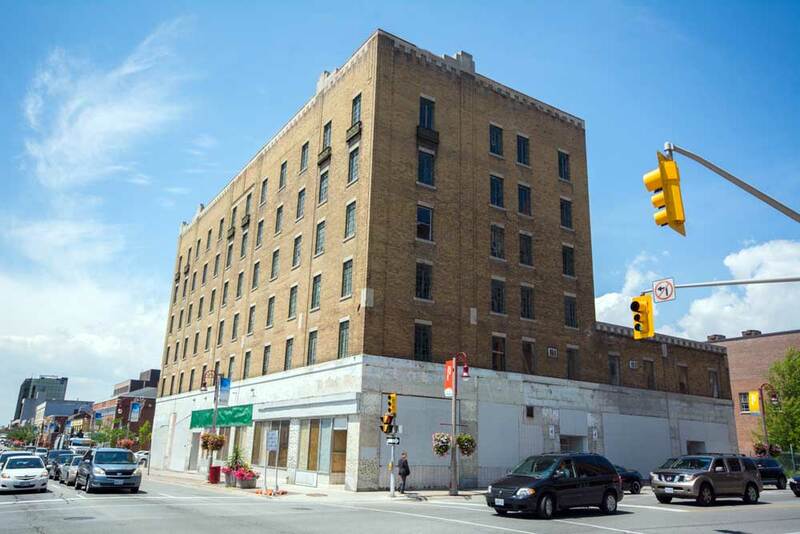 Speculation is rampant on social media and in Oshawa’s downtown as to the fate of the Genosha Hotel, which only months ago seemed back on track. Now, it seems to once again have storm clouds brewing over its historic roof. Tracey Christie, the president and CEO of Bowood Properties, the company responsible for the latest redevelopment effort, wants to clear the air – the project is getting done. “There’s nothing more than I would like to see than get that done,” he said in a recent interview with The Oshawa Express. Beginning in August, contractors and trades were hard at work inside and out on the historic hotel. Visible to passersby, the building received its first bath in years, as pressure washers washed away decades worth of city grit. Also, 150 new windows were installed. Climbing the adjacent Mary Street parking garage, viewers can see that the roof itself has been replaced. The parapet wall was also torn down and rebuilt. In summary, the work was all part of accomplishing Christie’s goal of getting it water- and weather-proof before the winter. “I think we performed a miracle,” he says. However, work was not only done on the outside. Prior to pulling workers out on Jan. 15, Christie says the interior was cleaned and is ready for new gas, water and electrical lines to be installed. The elevator shaft was also completely rebuilt as the historic mechanism wouldn’t stand up to today’s safety regulations. However, due to ongoing legal issues in obtaining ownership of the building, Christie says work has stopped not only to sort out the issue, but to save money as well. “I’m not a billionaire and this old machine…eats money,” he said of the building. No further details were provided on the nature of the legal wrangling, but Christie says that while the issue is “extremely complicated,” it’s not something he hasn’t dealt with before. The tie-up has already lead to a pair of extensions from city hall. When the redevelopment project was approved back in July, Bowood received approximately $1.5 million in assessment grants and loans under the city’s Central Business District Renaissance Community Improvement Plan to assist with the regeneration. However, as part of those incentives, the developer had a few caveats to complete, one of which was obtaining ownership of the property by the end of 2015. According to Paul Ralph, the commissioner of development services, an original extension was allowed until the end of February, and since then he has allowed another until the end of April. “They came back in the middle to late February asking for a further extension because discussions were ongoing, but had yet to be concluded,” Ralph says. Originally, the developer and owner only wanted until the end of March to get things sorted out, but Ralph says he took it a step further to the end of April. “Let’s be safe,” he said. Another caveat of Bowood’s agreement with the city is to have the property operational by this time next year. Pointing to his accomplishments to date and the work achieved at the site already, Christie says he is confident he will meet that deadline.